The entire crowd went crazy and everyone was mesmerized by his charm. This year April will be treating October. Yes ‘October’, the upcoming movie of the talented and handsome actor of B’town Industry Varun Dhawan, which will be releasing this 13th of April. The actor has impressed the fans with his movies in past and currently he is busy promoting his upcoming movie ‘October’. He is majorly focusing on youth for his upcoming movie as the movies seems to be a romantic love story. Therefore, Varun is leaving no bars to promote his film. As he visited Lakshmibai College in Ashok Vihar-III to interact with his fans. Even though Varun had a tight shoot schedule throughout the day, he made sure that he did not make his fans waiting in Delhi heat. The girls were so excited to see Varun that he almost got mobbed by them. The entire crowd went crazy and everyone was mesmerized by his charm. While interacting with students, Varun revealed about his film October, Shoojit Sircar's unique love story, as per him this movie is not a Love Story, but rather a story about love. He appealed everyone to watch the film. The film is completely shot in Delhi at Dwarka with a few portions shot at Connaught Place, New Delhi, and Defence Colony, South Delhi.Well, Varun will be portraying the character of Dan: A hotel management trainee and career-oriented person. Along with him the movie also stars Banita Sandhu and Gitanjali Rao in lead roles. 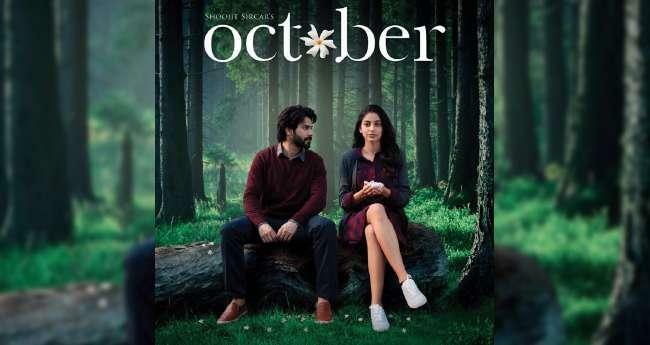 October is an upcoming 2018 Indian romantic drama film directed by Shoojit Sircar and written by Juhi Chaturvedi. Produced by Ronnie Lahiri and Sheel Kumar under Rising Sun Films productions, the film is scheduled for release on 13 April 2018.